In a small organization,There are two kinds of Employees i.e. Manager and Developer. Now we want to print salary of employee. 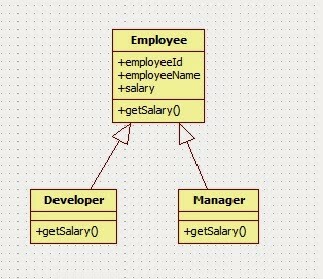 As you can see here, We are overriding getSalary() method of Employee class in Developer and Manager. Why we need to override getSalary()? Because we require specific implementation of getSalary() method based on Class. e.g. Developer class and Manager class have different bonus so we need different implementation for both. Why can’t you make access modifier more restrictive (e.g. public to private)? It’s a fundamental principle in OOP: the child class is a fully-fledged instance of the parent class, and must therefore have at least the same interface as the parent class. Making less visible would violate this idea; you could make child classes unusable as instances of the parent class. so even you made getSalary() method of developer private, you will be able to access getSalary() method of developer using reference of Employee(super class) even if you have made it private. so you can’t reduce access modifier while overriding method. Why can’t you override static methods? Because static methods are related to class not to state of object so You can declare static method in child class but it has nothing to do with parent class. It is method hiding not overriding. Can you override private methods? No,you can’t. A private method cannot be overridden since it is not visible from any other class. You can declare a new method for your subclass that has no relation to the superclass method. So it is not method overriding. Why can’t you override final methods? What if We change number of arguments? If you change number of arguments then it will be method overloading not overriding. Parent class method and child class method should have same method signature. Super keyword can be used to to call specific parent class method from child class.